Custom Printed Promotional Product Solutions. Partner with AlphaGraphics Today and Discover Effective Promotional Product Solutions. From custom printed promotional magnets and personalized calendars to branded thumb drives, pens or cups, we have the right promotional product solution to help promote your brand or special event. Ask an AlphaGraphics professional today about selecting the perfect product that meets your target audience demographics, campaign objectives, project budget and product physical size and shape for distribution. Small and light items like magnets and pens are great for bulk shipments while larger items like apparel or coffee cups are better for trade show or employee gifts. Choose from over 700,000 Promotional Items. Leverage our cost-savings partnership with industry leader ASI and choose from over 700,000 custom printed promotional products ranging from T-shirts, golf shirts, caps, key chains, bumper stickers, pens, computer accessories, mugs, cups, awards and more. 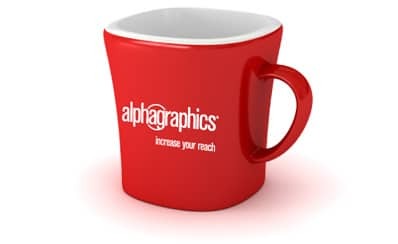 Ask an AlphaGraphics professional today for a custom quote or no-cost marketing strategy consultation on your next custom printed promotional product project. AlphaGraphics is Your Local Full-Service Promotional Product Solutions Partner. Our complete brochure printing services are perfect for point-of-purchase applications, trade shows or direct mail marketing. We are a one-stop solution for your design, printing and marketing projects. Featuring all standard banner, poster and sign sizes with complete finishing hardware options ranging from indoor easels, A-frames, hook and loop tape and custom frames— we have the right solutions for your banner, poster or sign project. Get Started Today and Discover Complete Promotional Product Solutions.